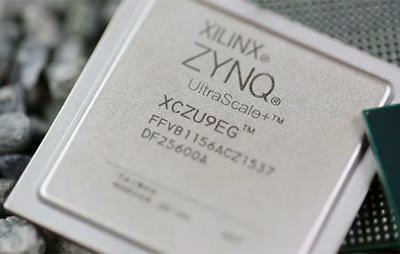 The Zynq UltraScale+ MPSoC, or simply ZynqMP for brevity, is a powerful and complex chip by Xilinx based on ARM cores and an FPGA. Within that chip, the PMU (Platform Management Unit) is a Microblaze processor that handles power states, clock and power domains and other very low-level tasks. It obviously has a crucial role for the chip. There is no “standard” PMU firmware image: every user is supposed to build a custom one. Luckily its code is open source, and publicly available on the Xilinx Embeddedsw repository. Unfortunately building a PMU firmware can be a bit annoying. One of the reasons is that it’s the only programmable Microblaze core in a chip that otherwise has only ARM cores. As such it needs an appropriate toolchain. One of the solutions is to built it using the Xilinx XSDK, a firmware IDE by Xilinx. But it is a heavyweight tool just to build a 128 kB firmware, and it’s non-trivial to automate in a build process. The other mainstream option is to let Yocto build it, which is a natural choice if you are using it to build the rest of your system. Some obscure rules are available in the meta-xilinx layer to build a Microblaze toolchain in an otherwise ARM64 configuration, and then use it to build the PMU firmware and its dependencies. This is a powerful method, but it makes it hard to understand how the firmware gets built. It also requires to build a toolchain and several packages at every build from scratch. Things get even more complex if you want to boot using U-Boot and its SPL, and here’s why. To know how the chip resources are to be managed, the PMU firmware needs a “configuration object” to be passed from the outside even before U-Boot proper can start. The Xilinx First Stage Bootloader (FSBL) is able to load the configuration object. But using FSBL has drawbacks, including a poor boot speed. The obvious alternative is U-Boot SPL, which is fast and the de facto standard in the embedded Linux ecosystem. Except it is currently unable to pass the configuration object to the PMU. The current best hack to boot with U-Boot SPL is to modify the PMU firmware source code to load a configuration object hard-coded in its own image. This removes the need for the SPL to load it. Implementing this hack requires additional build-time operations, and is implemented for example in the meta-topic Yocto layer. This hack works, although it forces to build a different PMU firmware for every different configuration (e.g. every board), but at the moment there’s not much that can be done. Moreover it adds to the complexity of the build process, since these hacks are not implemented in the meta-xilinx Yocto layer. Does building a PMU firmware really need to be that complex? Of course not! So in order to document and simplify the whole process, including the above mentioned hack to boot with U-Boot SPL, I wrote a shell script that does it in the simplest possible way. The design goals for this script are being simple, have minimal dependencies and to be easy to understand and modify. The resulting script is even simpler than I expected! It also works without the need to setup a Yocto environment or any Xilinx IDE: actually it only needs crosstool-NG to build the Microblaze toolchain and the PMU firmware source code. It also allows to build a toolchain once and reuse it for every build, meaning a different PMU firmware image can be rebuilt in less than 10 seconds. I published this script on the zynqmp-pmufw-builder GitHub repository. Feel free to use it for your projects, or simply to understand what’s going on when you use other tools!